As an integral part of the System 3000, the screened, insulated ERITECH downconductor conveys the lightning discharge current to ground with minimal danger of sideflashing. The lightning impulse is contained within the cable. Therefore the path of the lightning energy can be controlled to ground. The cable can be routed away from sensitive equipment, electrical wiring, structural steel and human work areas. Use of a single downconductor as opposed to multiple downconductors. Ability to isolate the structure being protected from the lightning energy. 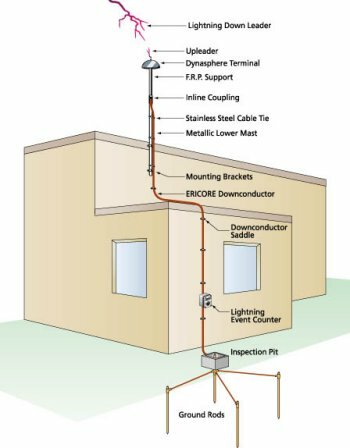 The ERITECH ERICORE downconductor cables are purpose-designed low inductance, low impedance cables designed to minimize voltage build-up due to lightning impulses. The photo at the above left shows the high voltage upper ERICORE termination. The correctly rated termination of the ERITECH ERICORE is critical, as this is point of greatest voltage build-up. The new ERITECH ERICORE Upper termination therefore has a tested 50% engineering safety factor built-in to ensure reliable operation under the harshest environments. For application advice, please contact ERICO.